USCG Aviation Patch United States Coast Guard 1970s Fully embroidered merrowed edge 57mm by 93mm two and one quarter inches by three and five eighth inches. 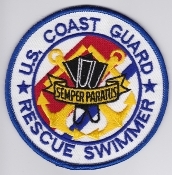 USCG Aviation Patch United States Coast Guard Rescue Swimmer SAR 1990s Embroidered on twill merrowed edge 105mm four and one eighth inches diameter. 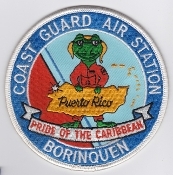 USCG Aviation Patch United States Coast Guard Station Borinquen Puerto Rico 1980s Embroidered on twill merrowed edge 103mm four and one sixteenth inches diameter. 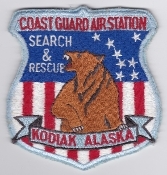 USCG Aviation Patch United States Coast Guard Station Kodiak Alaska Search And Rescue 1970s Fully embroidered cut edge 99mm by 93mm three and fifteen sixteenth inches by three and five eighth inches. 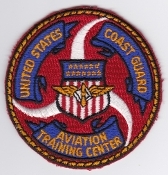 USCG Aviation Patch United States Coast Guard Aviation Training Center Mobile Alabama 1980s Embroidered on twill cut edge 78mm three and one sixteenth inches diameter.